Back in March, President Trump first introduced the idea of a US "space force", renewing a long-running debate that began almost 20 years ago whether the Pentagon’s space activities should be moved to a new command. Then in June, Trump explicitly called for the new branch to be created, despite resistance from the Air Force which oversees military space programs. Speaking alongside Defense Secretary James Mattis at the Pentagon Thursday, Pence announced that "establishing the Space Force is an idea whose time has come." And while big questions remain - while the Pentagon has begun the process of establishing Space Force as a 6th branch of the U.S. military, only Congress has the power to establish a new branch of the military - one thing is clear: Trump's reorganization of US defense will cost a lot of money, and for the first time we learned just how much when Mike Pence said that the Trump administration will call on Congress to allocate $8 billion over the next five years to establish the U.S. Space Force as the sixth branch of the military. "Our adversaries have transformed space into a war fighting domain already and the United States will not shrink from this challenge," Pence said. 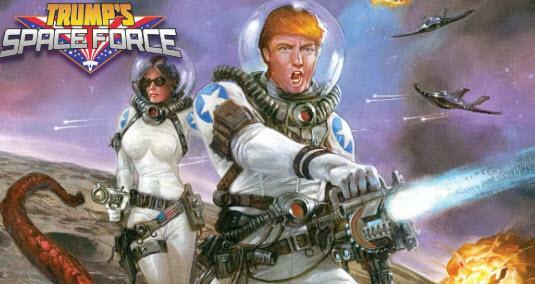 "History proves that peace only comes through strength, and in the realm of outer space, the United States space force will be that strength in the years ahead," he added. Today there are "tens of thousands of military personnel, civilians and contractors operating and supporting our space systems, together they are the eyes and ears of America’s warfighters around the globe", Pence said. The first step in the creation of Trump's space force calls for the creation of U.S. Space Command, led by a four-star flag officer. The second step is the creation of an "elite group of joint warfighters specializing in the domain of space." The report also calls for a Space Development Agency to develop new technologies, and establishing a new civilian position to oversee the standup of Space Force - an assistant secretary of defense for space. Curiously, while Secretary of Defense James Mattis previously disapproved of the idea saying last year he opposed creating additional bureaucracy at the Pentagon, on Thursday Mattis - perhaps impressed with all those billions that would be collected from taxpayers - changed his mind and said "space is one of our vital national interests" and is "no longer a new domain." For those curious, following Mattis' speech the DoD is expected to release a report to Congress on the creation of a separate Space Force. Predictably, it did not take long for the Democrats to lash out at the idea. Sen. Brian Schatz (D-Hawaii) on Thursday blasted the Trump administration's commitment to a space force, and suggested its only moving forward because Republicans won't speak out against it. "The VP just announced a new military branch - a 'Space Force,' because no R is willing to tell POTUS it’s a dumb idea," Schatz tweeted. "Although 'Space Force' won’t happen, it’s dangerous to have a leader who cannot be talked out of crazy ideas," he added, urging followers to elect Democrats in the November midterms.